3.5 out of 5 based on 189 bloggers and 17 commenters. 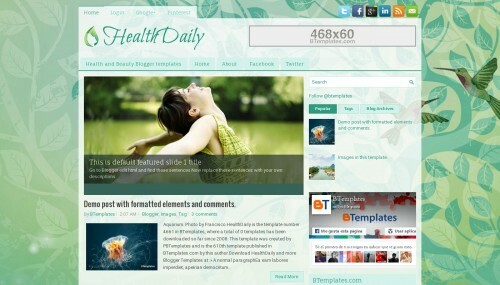 HealthDaily is a free blogger template adapted from WordPress with 2 columns, responsive design, right sidebar, fresh look, ads ready, footer columns, slider, social bookmarking icons, posts thumbnails, tabs, breadcrumbs, a background pattern, related posts support and floral motifs. Excellent template for blogs about animals, art, education, family, fashion, health and beauty, nature or sports. OY Oy Oy very nice. Its awsome, i just love it but still i wanna ask 1 question about how to change default slide from html. i cant find the sentences to replace my own descriptions. help me soon as you can. Thankyou. I liked the article. I would really appreciate more like this one. Thanks again for your hard work. I liked the article it is very good article.good job….. I love it. I like your templates. It was very easy for me to change the setting of the templates. Anyone can easily use these templates. greaettt…..Thanks again for your hard work. saludos, disculpen a mi no me deja, descargar, que debo hacer. This template is so cool, I use that and very recommended. It’s very nice and useful post for me. I am using this theme for 2 months and i loved too much but there is a lit bit problem in this theme that it doesnt support pages in crosscol.